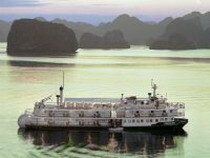 The Emeraude is one of the biggest and most modern Ships ever seen in Halong Bay. The 3-deck Ship is 55m long with 38 beautiful cabins and a suite equipped with modern furniture. Two bars and a restaurants located on the Ship can satisfy the taste of all tourists. After hard day of traveling, you can relax on board in the 2 Massage Rooms or in the Beauty Salon.